In Darwin’s evolutionary-advanced brain, such thinking was obviously justified. If you are a member of the “more intelligent gender,” you naturally have an advantage over the “less-intelligent gender” to know that your gender is inherently more intelligent. Therefore, just as through one man [not “one woman”] sin entered into the world, and death through sin, and so death spread to all men, because all sinned (Rom. 5:12). For as in Adam [not Eve] all die, so also in Christ all shall be made alive (Cor. 15:22). But the free gift is not like the transgression. For if by the transgression of the one [clearly Adam, not Eve] the many died, much more did the grace of God and the gift by the grace of the one Man, Jesus Christ, abound to the many (Rom. 5:15). In the Lord, neither is woman independent of man, nor is man independent of woman. For as the woman originates from the man, so also the man has his birth through the woman; and all things originate from God (1 Cor. 11:11-12). There is neither male nor female; for you are all one in Christ Jesus (Gal. 3:28). Perhaps the greatest honorary distinction ever given to women is the fact that God sent His Son to enter the world through one of them. One might suspect that the Son of God would make His entry by descending from the stars in a blaze of glory to touch down on a mountaintop. But Jesus mysteriously entered into Mary’s womb and stayed there for nine months before making His humble appearance. He shamelessly grew from babyhood to manhood under a mother’s care, and we are told in the Gospels that, not only did Jesus serve women, He had good female friends, like Mary and Martha. Jesus’ friends also included a group of women who traveled with Him and His apostles whom Scriptures say contributed “to their support out of their private means” (Luke 8:1-3). Although Jesus chose no women to serve in His band of 12 apostles (and there may have been some very good reasons for that which have nothing to do with female ability), the indisputable fact remains that God used women who had money to fund the expenses of Jesus and the 12 apostles. Incidentally, that is something not said of any men. Although the Bible prescribes differing roles for men and women, it never states that women are incapable of performing certain roles that are normally filled by men. In fact, the Bible sometimes surprises us with examples that prove women are every bit as capable of filling men’s roles as men are, should God will it, as if to send a message to misogynists. Think, for example, of women like Miriam, Deborah and Huldah, all prophetesses, through whom God spoke to the people of Israel—both men and women. Deborah was not only a prophetess, but also a judge over all of Israel, just as much as Gideon, Jeptha and Samson were judges during their lives. We read that “the sons of Israel came up to her for judgment” (Judg. 4:5). So she rendered decisions for men, not just women. Deborah faced at least one misogynist during her administration, an army general named Barak, who had difficulty receiving God’s word through a female vessel. And because Barak was skeptical about Deborah’s prophetic command for him to go to war against the Canaanites, she informed him that the honor of killing the Canaanite general, Sisera, would go to a woman. And Deborah’s prophecy came to pass. A woman named Jael drove a tent peg through sleeping Sisera’s head (see Judg. 4). The story ends with Barak singing a duet with Deborah that includes lyrics that are full of praises for both Deborah and Jael (see Judg. 5). Barak apparently became a believer in “women’s ministry”! These were not the only women whom God used in biblical days as His mouthpiece to men and women. In the New Testament, we read of the prophetess Anna, who also become an evangelist of sorts, speaking of Jesus to all those “who were looking for the redemption of Jerusalem” (Luke 2:38). Jesus’ mother, Mary, prophesied at least once, and we hear God’s words through a woman every time we read the Magnificat (see Luke 1:46-55). We are told that Philip the Evangelist had four daughters who were prophetesses (Acts 21:8-9). That should not be too much of a surprise, as God foretold by the mouth of the prophet Joel that when God poured out His Spirit, both sons and daughters in Israel would prophesy (see Joel 2:28). Beyond that, Paul wrote of women prophesying in church gatherings (see 1 Cor. 11:5). It is clear from the context that men were present. It is sad, in light of these scriptural examples and others that could be cited, that Paul’s apparent prohibitions against women teaching men are so often interpreted apart from the greater context of the Bible. When a passage of Scripture seems to contradict a recurring biblical theme, that passage deserves more thought, because God is not confused. If you are interested in exploring various interpretations of 1 Cor. 14:34-36 and 1 Tim. 2:11-14, I recommend Felicity Dale’s concise overview (see http://simplychurch.com/a-simple-guide-to-the-challenging-scriptures-for-women/). I commend to you [the entire church at Rome] our sister Phoebe, who is a servant of the [entire] church which is at Cenchrea; that you receive her in the Lord in a manner worthy of the saints, and that you help her in whatever matter she may have need of you; for she herself has also been a helper of many, and of myself [Paul, a man] as well (Rom. 16:1-2, emphasis added). What an endorsement! We don’t know exactly what ministry Phoebe fulfilled, but whatever she was doing for the Lord, it must have been quite significant to warrant Paul’s endorsement of her to the entire church in Rome. Greet Prisca and Aquila, my fellow workers in Christ Jesus, who for my life risked their own necks, to whom not only do I give thanks, but also all the churches of the Gentiles; also greet the church that is in their house. Greet Epaenetus, my beloved, who is the first convert to Christ from Asia. Greet Mary, who has worked hard for you. Greet Andronicus and Junias [or Junia, as the KJV translates it, which is feminine] my kinsmen, and my fellow prisoners, who are outstanding among the apostles, who also were in Christ before me (Rom. 16:3-7, emphasis added). It is interesting that Paul lists Prisca before her husband Aquila in his greeting, something he does again in 2 Tim. 4:19. Prisca, along with her husband, both are mentioned in Acts as explaining to Apollos “the way of God more accurately” (Acts 18:26). There’s another case of a woman teaching a man. Regarding Junias, it would seem logical to think that a person who is “outstanding among the apostles” could only be an apostle. If the correct translation is Junia, then she was a female apostle. Prisca and Mary were both workers for the Lord. Greet Ampliatus, my beloved in the Lord. Greet Urbanus, our fellow worker in Christ, and Stachys my beloved. Greet Apelles, the approved in Christ. Greet those who are of the household of Aristobulus. Greet Herodion, my kinsman. Greet those of the household of Narcissus, who are in the Lord. Greet Tryphaena and Tryphosa, workers in the Lord. Greet Persis the beloved, who has worked hard in the Lord. Greet Rufus, a choice man in the Lord, also his mother and mine. Greet Asyncritus, Phlegon, Hermes, Patrobas, Hermas and the brethren with them. Greet Philologus and Julia, Nereus and his sister, and Olympas, and all the saints who are with them (Rom. 16:8-15, emphasis added). Paul’s acknowledgment and commendation of the service of so many women hardly makes him look like the misogynist that he is often portrayed as being. Clearly, in Paul’s mind, women played valuable roles in the early church. As a postscript, regardless of what you or I may believe about women’s roles in teaching and leadership in the church, in my travels around the world over the past 35 years interfacing with Christian leaders, I’ve met many female pastors whom God seems to be using to make disciples for His glory. I once met a woman in China who was responsible for planting over 500 churches and who was highly respected by her male peers. Although such women don’t fit so well into everyone’s theology, they do fit into my thesis that women are every bit as capable of filling men’s roles as men are, should God will or allow it. It is noted by some critics that a few famous Bible characters were men who were polygamists. Since polygamy devalues women and is a form of misogyny, does not God’s selection of polygamists make Him a misogynist? The most famous biblical polygamist is probably Solomon, who took 700 wives and 300 concubines (see 1 Kings 11:3). I suspect that Solomon would have had trouble just remembering all of his wives’ names. And how much time could he have possibly devoted to each one? Surely many were virtual strangers. They might all have had access to his wealth, but not one of them enjoyed the blessing of being cherished and loved by a man who was uniquely devoted to her. Polygamy similarly robs children of a devoted father, not to mention all of the single men who are mathematically robbed of having wives. But I don’t believe Solomon’s selfishness and misogyny make God a misogynist. Before Solomon was born, God commanded concerning any future king of Israel, “He shall not multiply wives for himself” (Deut. 17:17). Solomon knew what God commanded, disobeyed and ultimately suffered the consequences. Although Solomon was divinely granted great wisdom, he is perhaps history’s greatest proof that possessing divine wisdom and applying it are two different things. And God didn’t stop Solomon from having 700 wives for the same reason that He doesn’t stop you or me from doing stupid things. He’s given us free will. I submit that any already-married man who has ever taken a second wife (including those mentioned in the Bible) has had a hard time looking both wives in the eye. Surely his God-given conscience condemned him as he made his second set of vows, and surely he knew he was not treating his first and second wife as he would want to be treated. And surely every biblical polygamist knew that the book of Genesis did not include a story of God’s creation of Adam and Eve and Veronica and Bertha. What About “Wives Submitting to Their Husbands”? 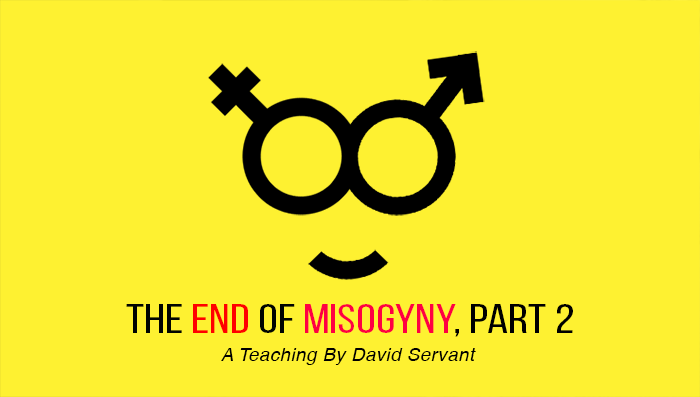 Perhaps the greatest criticism leveled at the Bible for promoting misogyny is based on Paul’s instructions to wives to “be subject to their husbands as the church is subject to Christ” (Eph. 5:22-24). At first glance, such instructions certainly appear to promote gender inequality. It sounds as if Paul advocates wives being subservient to their husbands. It should be noted, however, that Paul’s instructions to wives are preceded by identical instructions to all believers: “Be subject to one another in the fear of Christ” (Eph. 5:21, emphasis added). Paul is clearly calling for a universal subjection. Thus it is not the kind of submission that implies that anyone is giving out orders or is subordinate. Rather, it is a mutual submission that is based on reciprocal respect, humility and love. That would include, of course, wives submitting to their husbands and husbands submitting to their wives. The idea is to get along with each other. And it is directly after his exhortation for universal mutual submssion that Paul follows with a specific application to wives, literally saying, “Wives, to your own husbands, as to the Lord” (Eph. 5:22). The words “be subject to” aren’t actually found in that sentence, but are of course implied by the context. But the context must be read, or the sentence is meaningless. So the kind of subjection Paul expects of wives towards their husbands is in the same category of subjection he expects of everyone towards everyone else. Wives should be respectful, humble and loving towards their husbands, just as they are towards the Lord. For the husband is the head of the wife, as Christ also is the head of the church, He Himself being the Savior of the body. But as the church is subject to Christ, so also the wives ought to be to their husbands in everything. Husbands, love your wives, just as Christ also loved the church and gave Himself up for her” (Eph. 5:23-25). Obviously the kind of subjection to which Paul is referring is not of the doormat variety; nor is it analogous to anything found within an abusive relationship. Rather, the example Paul uses is of the church subjecting itself to Christ who loves the church and who literally gave His life for it. In the Christian family, husbands are to serve as loving leaders, not as tyrants. So, taken in context, Paul’s instructions to wives do not appear to be nearly as misogynistic as they are often twisted to be. True Christians gladly subject themselves to Christ, as they know He cares about them infinitely. Similarly, wise Christian women who desire strong, stable marriages subject themselves to their husbands with honor, humility and love. And wise Christian husbands love their wives “as Christ loves the church.” That simile is certainly not a misogynist sentiment, but rather a mandate that holds husbands to the highest possible standard of love and calls them to imitate the example of Jesus, history’s greatest women’s liberator. Note that Paul never says, “Husbands, make sure your wife submits to you, reminding her often that you are the head.” No, husbands have one job, and that is to love their wives as Christ loves the church. Any husband who says to his wife, “I’m the head, and so you better submit to me as the Bible commands you” is indeed a head…a pinhead. He is violating the Golden Rule, not treating his wife as he would want to be treated if their roles were reversed.